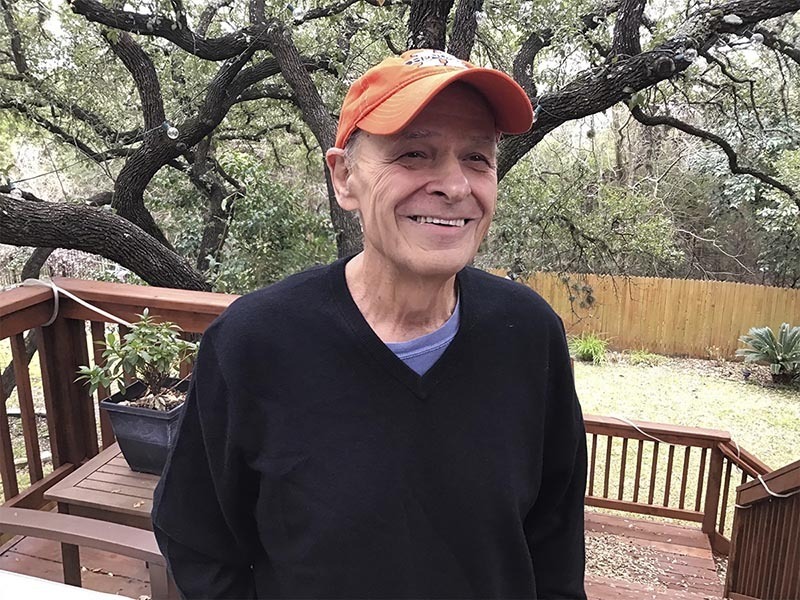 March 19, 2019-- In 2005, the New York Times named the Vietnam War epic novel The Things They Carried as one of the twenty-two best books of the last quarter century. On Thursday March 28, its author, Tim O’Brien, will visit Toms River to speak to students and the community about his work and his experiences at war. 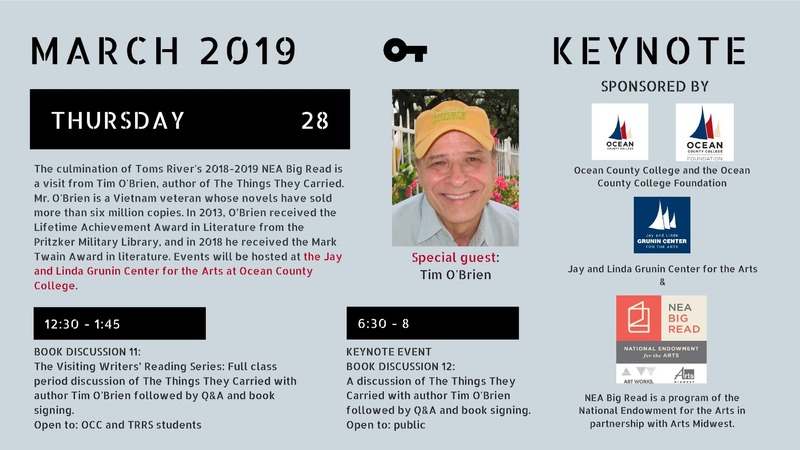 O’Brien’s keynote speaking engagement, which will take place 6:30 to 8 p.m. at the Jay and Linda Grunin Center for the Arts at Ocean County College, is the culminating event of NEA Big Read, a literary campaign hosted by Toms River Regional Schools. The district selected The Things They Carried as its Big Read novel for 2019 for a number of reasons, including its preexisiting popularity among teachers and the fact that Toms River has the highest number of veterans in New Jersey, with 6,900-plus, many of them Vietnam vets. Veterans have comprised a major component of the district’s NEA Big Read program which began Jan. 23 at East Dover Elementary School and continued with NEA Big Read Days at all secondary schools. Many local veterans have participated, speaking to students, sharing photographs and artifacts from Vietnam, and providing perspective and inspiration for students to utilize for various cross-curricular projects and reflections. The district’s primary partner for the program is Ocean County Library, which has hosted a number of fun and relevant events over the course of the past two months. Prior to his keynote engagement, O’Brien will host an afternoon discussion for OCC students and TRRS intermediate students as part of the college’s Visiting Writers’ Reading Series. His multiple engagements have been made possible by the district’s NEA Big Read grant, as well as significant sponsorship contributions from Ocean County College’s English Department; the Ocean County College Foundation; and the Grunin Center for the Arts. O’Brien is renowned worldwide. He received the National Book Award in Fiction in 1979 for his novel Going After Cacciato. The Things They Carried received the Chicago Tribune Heartland Award in fiction and was a finalist for both the Pulitzer Prize and the National Book Critics Circle Award. The French edition of The Things They Carried received one of France’s most prestigious literary awards, the Prix du Meilleur Livre Etranger. His novel In the Lake of the Woods, published in 1994, was chosen by Time magazine as the best novel of that year. In 2012, O’Brien received the Richard C. Holbrooke Distinguished Achievement Award from the Dayton Literary Peace Prize Foundation, and the following year he earned the Lifetime Achievement Award in Literature from the Pritzker Military Library. Most recently, in 2018, O’Brien received the Mark Twain Award in literature. His novels have sold more than six million copies and have been translated into more than 20 languages. The author has received enough acclaim to become the focus of a movie. Brooklyn-based filmmaker Aaron Matthews is producing a documentary about O’Brien, and will be filming during the March 28 engagements. The evening keynote event is free and open to the public. There is no link or need to RSVP but seating is limited. Attendees will have the opportunity to have their copies of The Things They Carried signed after the speaking engagement, and those without a copy of the novel will have the chance to purchase one at the show. 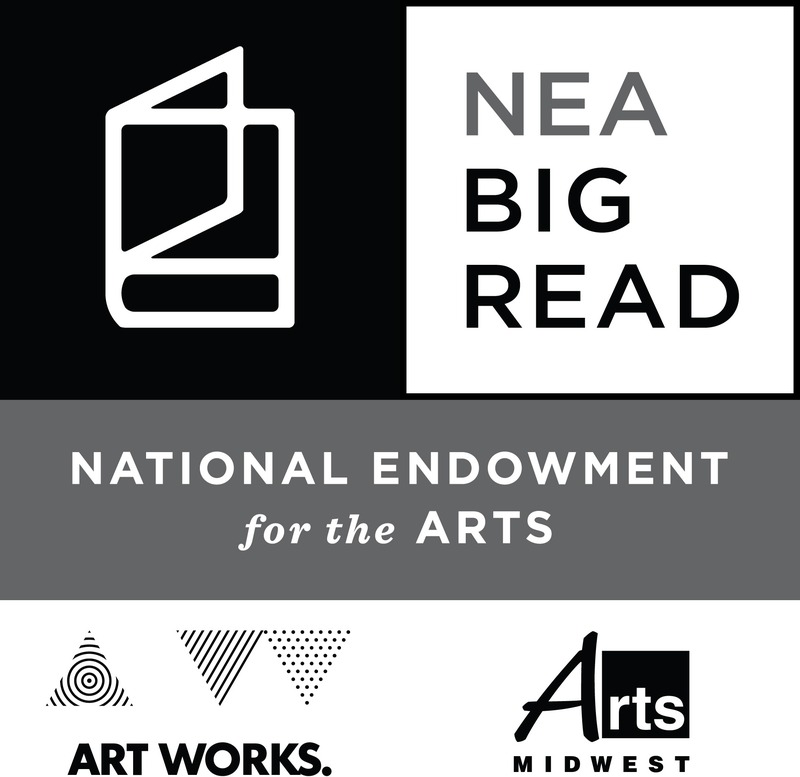 NEA Big Read is a program of the National Endowment for the Arts in partnership with Arts Midwest. For more information, visit https://www.arts.gov/national-initiatives/nea-big-read.